TL;DR: Classy‘s personable culture derives from a genesis story that includes friendship, charitable giving, and Will Ferrell quotes. Named after a famous line from “Anchorman,” the company’s fundraising platform helps organizations grow their supporter base and retain donors with optimized branding features, powerful integrations, and comprehensive analytics. CEO and Co-Founder Scot Chisholm chatted with us about the future of fundraising and how the company maintains its grassroots enthusiasm. When a group of friends, a passion for social causes, and the movie “Anchorman” come together, things get Classy. Scot Chisholm and his friends wanted to raise money for the American Cancer Society in 2006, but none of the usual methods of being a supporter resonated with them. So the San Diego residents organized an unofficial event called the StayClassy pub crawl, a name they borrowed from Will Ferrell’s sign-off in the movie: “Stay classy, San Diego.” The event raised $1,000, but Scot said the American Cancer Society wasn’t exactly thrilled that they “went rogue,” as Scot described it. “It made us wonder why there’s so much friction in the giving process and why it’s so difficult for someone to get involved, in the way they want, to support an organization,” he said. From there, Scot and his friends started partnering with local charities to make philanthropy fun and engaging. Eventually, they built an early fundraising platform for a music festival expecting 5,000 attendees. The app allowed people to buy a ticket and set up a personal fundraising page to share on social media. CEO and Co-Founder Scot Chisolm, center, started Classy with friends to raise money for a personal cause. “It doesn’t sound super innovative now, six or seven years later, but at the time it was really remarkable to the nonprofits we were benefitting through the show,” Scot said, adding that the organizations asked to continue using the app for their own campaigns — signaling the lightbulb moment when Scot and his friends quit their full-time jobs, rebuilt the platform from scratch, and launched Classy in 2011. Classy now supports more than 4,000 nonprofits in the United States, Canada, and Australia, ranging from small, local charities to international organizations, including The Trevor Project, the Salvation Army, Charity Navigator, and Shriners Hospitals for Children. The platform’s all-in-one fundraising suite includes crowdfunding and peer-to-peer campaigns, website donations, custom branding and design capabilities, and integrations with Salesforce, along with event registration, fundraising, and management. Classy prioritizes responsive designs with other mobile-optimized features like text message sharing. The Classy platform optimizes its fundraising pages for a variety of devices and networks to make it easier to give. The emphasis on flexible fundraising methods enables nonprofits to better reach younger generations, according to Scot, while also continuing to serve more traditional donors. To help organizations transition to online fundraising and find success, Classy’s platform enables nonprofits to showcase their branding and communicate effectively with supporters — a big step up from design in the dawn of online fundraising, according to Scot. 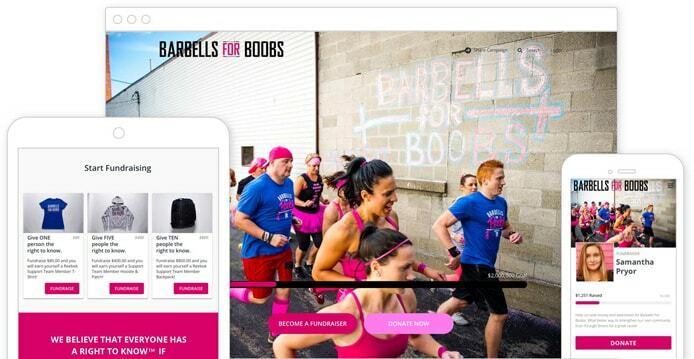 Classy takes a site builder approach to helping nonprofits customize their fundraising pages. By making the nonprofits — and not the platform — the central focus, Classy gives users total control over their fundraising pages. Scot compared the white-label platform and content management system to user-friendly website builders like Squarespace and Weebly, adding that UX design has been important to the Classy team since the beginning. Classy’s approach to online fundraising seems to be working — organizations generally see a massive jump in conversions, Scot said, adding that some of the larger nonprofits saw rates jump by 20% or more. With a proven record of attracting new donors, Classy’s current focus is retaining those supporters and encouraging long-term donor relationships. Recurring givers have a lifetime value more than five times greater than a one-time donor, Scot explained, but only about 25% to 30% of contributors return regularly. 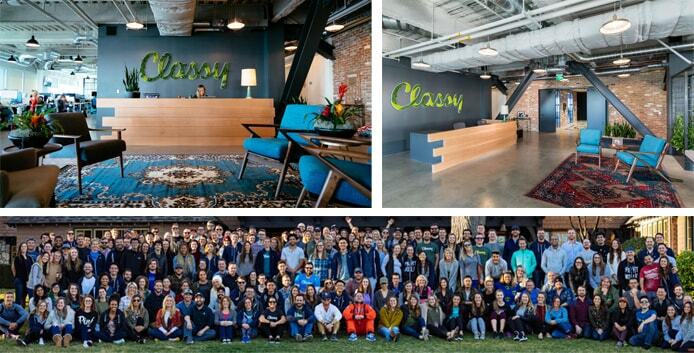 Still headquartered in San Diego, Classy employs more than 220 people. This subscription-like feature — similar to recurring billing for a product or service — allows supporters to commit to a donation regimen and facilitates more communication between the charity and its patrons. The founders consider Classy to be a social enterprise that isn’t just about making a profit. Aside from helping nonprofits be successful, the company frequently promotes clients’ causes. 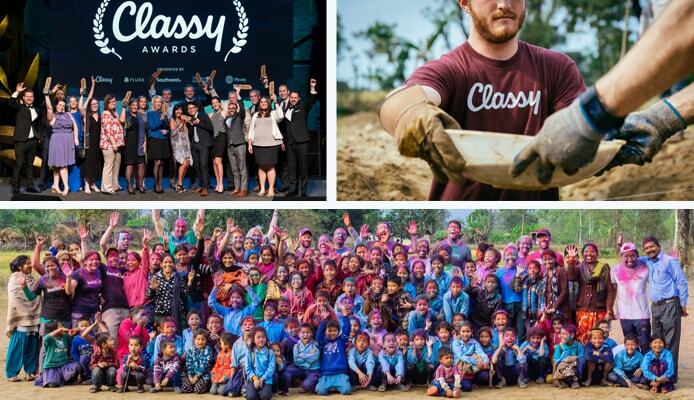 The annual Classy Awards recognizes organizations for noteworthy accomplishments — and the charities don’t have to be a Classy user to be nominated. Classy participates in charitable giving by recognizing nonprofits and traveling to Nepal to build a school. Each year, Classy selects one of the award winners for the company’s ClassyGives initiative, where employees run a fundraiser for the chosen organization. Last year, the company raised $130,000 for buildOn to build a school in Nepal and sent 15 people to help with the construction. Classy also hosts the Collaborative, a conference that convenes social leaders to discuss ideas and technologies advancing the sector. Now in its fifth year, the Collaborative draws thousands of attendees and will take place in Boston from June 12 to 14.